I decided this year to stop saying learning is fun. I was preparing a tech activity for kindergartners when I decided to kick the habit. I figured if it matters, I'd start out right at the beginning of the line. Grade 0. I found the results encouraging, so I've kept at it. Before I'm accused of heresy or (worse yet) being boring, I will point out a few things. I love learning. I love what I get to do in education. I could say I often have fun learning new things and helping others to learn. I've seen a room come to life when I set students lose on learning activities I've created. I'm also a game designer. People from all over the world have told me me about the fun they've had with my games. I've made money from fun, explored fun and created fun more than almost anyone I work with regularly. But I made this decision to stop saying learning fun. I did it because words matter. But why cut out the word fun? Don't we want kids to associate school and learning with positive words like that? I gave it the ax because it's highly valued and too vague. That's a volatile combination. 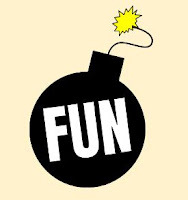 We could call "fun" the three-letter f-bomb. In education, where stakes are high and time is limited, I see it as a dangerous risk I don't want to touch. In our culture, fun often becomes the ultimate measure of value for an activity. "At least you had fun," we say. While not a bad thing in itself, we know for a fact many people use that to write off harmful decisions they make. At the very least, it's also a justification for what was otherwise a waste of time. Fun is a big deal to us and we want these school things to be associated with it. By saying learning is fun, we ultimately are saying it has value because fun has value. In the short term, when most of the class is smiling or laughing as the learning happens, it seems silly to be so concerned about this. But school and learning are long term affairs. 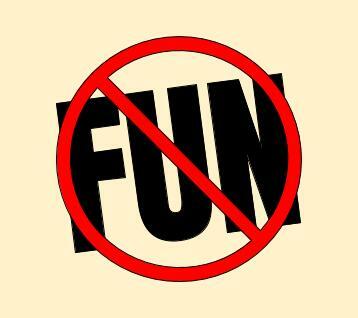 Giving learning value because fun is valuable might have some serious consequences. Even if we as teachers wouldn't word it quite that way, I'd bet money that's how a lot of our students hear it. And I'd also bet there will be times when learning isn't fun for them. What does that imply? I actually value learning because it is a vital means in which we realize our potential. It is required for the journey to becoming the individuals we are meant to be. That makes it far more valuable than fun. Now, if I end up having some fun along that journey, bonus! Can we enjoy those times together without missing the point? Then there's the ambiguity of the word itself. My friend Kory Heath is a game desire I admire. He says fun is one of those things people can't define, but they know when they're having it. Why analyze it beyond that? But teaching is serious business and we should think about it more. As people, we have fun with a vast array of activities. But not all of us have fun with the same activities. I don't enjoy watching sports, for example, though many people can make a party out of it. I have entertained hundreds of people with tabletop gaming events. I can't comprehend how a person wouldn't want to join us. But I know a few friends and family members who (though they love to have fun) have almost no fun playing games. When we use the word fun in class, think of all the pictures that come to mind in our students' heads. What activities do they imagine? What excitement, laughter and other positive emotions are they thinking of? Do we also imagine that the fun we regularly find in learning looks just like what they're imagining? I'm sure there are a few in every class who have absolutely no overlap between fun activities they dream of and what they experience regularly in school. That certainly becomes true as the students get older. I am impressed with teachers who seemingly can make every lesson fun. The reality, though, is some required content is challenging and, at least to some students, uninteresting. It requires perseverance. And not every teacher is an entertainer. It's not a terrible thing to admit this: There will be necessary, good lessons and maybe entire classes that students wouldn't describe as fun. If we tell students learning if fun, do we risk making them feel something is wrong (with the class, the teacher or even themselves) when it's not feeling like they expect fun things to feel? So You're Really Making This About a Word? I can hear what some of you are thinking. I'm overreacting. Couldn't we just solve this by saying, "Learning can be fun." What's wrong with that? I'd say that's a step in the right direction, but we can do better. Depending on the age of the students, I might refer to it as enjoyable or surprising. When working through a tougher problem, I could say the end result is satisfying or rewarding. I'll talk about simply liking to learn or at least liking to learn certain things or in certain ways. For younger students I might talk about that little bubble of joy that rises up inside when we discover something interesting or figure out something that used to confuse us. In fact the more I thought about this, I actually started seeing how we use the word fun lazily. It's too easy to toss it around and attach it to class activities, knowing our kids value fun greatly. Even though we'd probably admit, everything that "fun" means to students simply doesn't accurately describe a lot that learning entails. We know most high school students would never describe the regular routine of school as fun. "Boring" is far more likely, according to any study I've heard. I asked our students in a survey myself a few years ago and that's exactly the word that rose to the top of the list. No one I talked to about it was surprised. I'm convinced these points I've raised here are involved in that travesty. If nothing else, every time I stop myself from saying learning is fun, I'm reminded of the weight of what we do. I'm reminded my words matter. This past week I had to meet with a teacher in that kindergarten building. Many of those students saw me and asked excitedly if I was coming into their class to do another tech activity. From what the teachers have told me, all the classes loved it. Probably many of them would say it was fun. But they didn't hear that from me. Please help me improve this blog by completing this short survey. Unless specified elsewhere, posts and images copyright Mike Petty 2013. Simple theme. Theme images by mammuth. Powered by Blogger.